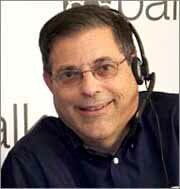 Award winning journalist Gary Baumgarten hosts the News Talk Online show on Paltalk.com. He asks critical questions, and invites people from all around the world to talk directly to his newsmaker guests using Paltalk's voice over IP technology. Gary came to Paltalk as director of news and programming from CNN where he was the radio bureau chief and correspondent in New York for a decade, where he covered, among other things, the 9/11 attacks in New York and Hurricane Katrina. Prior to that he was managing editor at Detroit Radio News Service and a reporter for the Jackson (MI) Citizen-Patriot, the Detroit News and a number of weekly newspapers. Paltalk is the largest multimedia interactive program on the Internet with more than 4 million unique users. News Talk Online is also syndicated by CRN Digital Talk Radio to cable systems serving an additional 12 million households.